Every Christian knows that believing in God requires a normal spiritual life, namely spiritual devotion. It is the foundation of establishing a proper relationship with God and the way of practice that is absolutely necessary in the growth of our spiritual life. Then, how should we practice spiritual devotion to achieve good results? Today, let’s communicate this aspect of the truth together. 1. We should focus on quieting our hearts before God in our spiritual devotions, which is the precondition for obtaining the work of the Holy Spirit. Many of us can regularly practice spiritual devotion every day but we often can’t quiet our hearts during that time, for sometimes we are preoccupied with some family matters or work stuff, or are anxious to deal with these problems quickly. As a result, our spiritual devotions are just abiding by a rule, because our bodies are here while our hearts are elsewhere. The Lord Jesus said, “God is a Spirit: and they that worship Him must worship Him in spirit and in truth” (John 4:24). This is God’s requirement of us. Obtaining the work of the Holy Spirit and achieving good results in spiritual devotions require worshiping God with an honest heart. During our spiritual devotions, if we are distracted by outward matters, such as our work or lives, and thus we go through the motions and wait for the end of spiritual devotions, then we can only understand the literal meaning of God’s words and gain no enlightenment. In this case, after spiritual devotions, we won’t feel enriched at all. Spiritual devotions like this won’t produce any results. God’s words say, “Every one of you must take time away from every person, matter, and object for your personal spiritual devotionals, where you will be able to bring peace to your heart and quiet yourself before God. You should have your own individual devotional notes where you can record your knowledge of God’s word and how your spirit has been moved, regardless of whether what you write down is profound or superficial. Quiet your heart before God with intention. If you can dedicate one or two hours to a true spiritual life during the day, then your life that day will feel enriched and your heart will be bright and clear. If you live this kind of spiritual life on a daily basis, then you will be able to give your heart to God more and more, your spirit will become stronger and stronger, your condition will become better and better, you will become more capable of walking the path led by the Holy Spirit, and God will bestow more and more blessings upon you.” From these words we know that if we want to achieve good results in spiritual devotions and gain the work of the Holy Spirit, we should spend one or two hours a day in practicing putting away family or work matters with intention, quieting our hearts before God and praying for Him to lead us to understand His words in a quiet place. Only in this way can we be able to pour our whole hearts into God’s words. 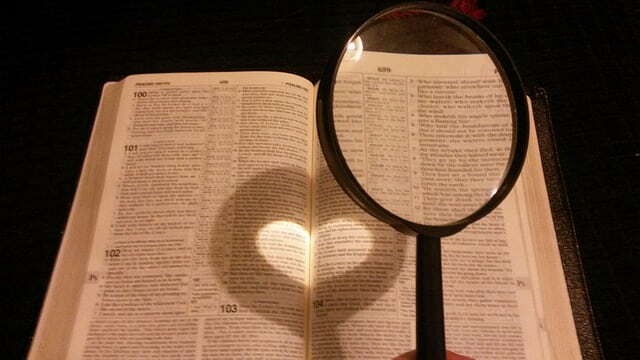 When God sees our hearts of seeking the truth, He will enlighten and guide us. This way, not only will we be able to have some understanding of God’s will, we will also come to know our own shortcomings and deficiencies. In addition, we should take our devotional notes every day, recording at any time how our spirits have been enlightened, so that we can read and ponder over these notes at ordinary times. By practicing quieting our hearts before God like this every day, we will be spiritually keen and be able to seek God more when encountering matters. This being so, we will grow closer and closer to God and our life will grow quickly. 2. We should not read God’s words in an aimless way; we should read God’s words pertaining to our practical difficulties and shortcomings. From these words, we can see that we should purposefully read God’s words, that is, consciously find and read some relevant parts of God’s words according to our practical states and difficulties. God’s words will reveal our wrong motivations and notions and point out to us the right path of practice. Then we should put aside our own incorrect motivations and opinions and act based on God’s requirements. By doing so, our problems will be solved, our states will be more and more normal and we will become clearer about God’s will. This way, due results will be achieved in our spiritual devotions. For example, we always position ourselves high above our brothers and sisters when getting along with them. Once we disagree with others about an issue, we always want to make them listen to us, with the result that they are unwilling to be in contact with us and then keep away from us, which makes us very upset. Then we can practice spiritual devotion pertaining to this problem and read the words of the Lord Jesus, “For whoever exalts himself shall be abased; and he that humbles himself shall be exalted” (Luke 14:11). God requires us not to exalt ourselves but be humble. However, we always seek to stand above others, thinking that our vanity and desire for status will be satisfied in this way. As a result, our brothers and sisters dislike us and keep us at a distance. Conversely, those humble people who always maintain an attitude of humility and seeking, do not hold onto their own views in all matters but set aside themselves and listen to advice from others, humbly consult and learn from others when encountering something that they don’t understand—such people are liked by God. Through pondering like this, we know how to act to accord with God’s will. So, when we get along with our brothers and sisters in the future, we should consciously let go of our own mistaken pursuits and be a humble person according to God’s words. From the fellowship above, we can see that when practicing spiritual devotions, we should pay attention to drawing upon our real difficulties and problems and finding answers to them in God’s words. This way, our spiritual devotions will achieve definite results. Of course, sometimes we are unable to precisely grasp our conditions and thus our problems cannot be completely solved once. That requires us to carry this burden and continue to seek the truth to solve them. 3. We should focus on contemplating God’s words and integrating God’s words to reflect on ourselves. Sometimes we feel that our condition is normal and that there is no issue to be resolved, but we should not just be satisfied with understanding the literal meaning of God’s words or reciting some passages of God’s words when practicing spiritual devotions; instead, we should ponder over God’s words more and integrate these words to reflect on ourselves to know which aspects of us are still not after God’s will. God’s words say, “When reading His words, Peter was not focused on understanding doctrines and he was even less focused on obtaining theological knowledge; instead, he was focused on understanding the truth and grasping God’s will, and achieving an understanding of His disposition and His loveliness. He also tried to understand the various corrupt states of man from God’s words, and understand the corrupt nature of man and man’s true shortcomings, achieving all aspects of the demands God makes of man in order to satisfy Him. He had so many correct practices within the words of God; this is most in line with God’s will, and it is man’s best cooperation in his experience of the work of God” From God’s words we know that when Peter read God’s words, he was not focused on understanding some theological knowledge or doctrines; instead, he was focused on pondering God’s will from His words, knowing his own corrupt states and then acting exactly based on God’s requirements, finally casting off his corrupt disposition and satisfying God. We should follow the example of Peter’s practices. No matter which aspects of God’s words we read, we should not cursorily read them because we think that we haven’t revealed this aspect of corruption, but instead we should accept God’s words first and integrate these words to recognize our deficiencies, shortcomings and corrupt dispositions. Through pondering and seeking like this, we will find out some problems that we are unaware of in ordinary life. Along with constantly solving these problems, we will gain more truth and achieve some changes in our life disposition. Only this kind of spiritual devotion can truly achieve effects. I remember one time when I practiced spiritual devotion, I saw that the Lord Jesus said, “Truly I say to you, Except you be converted, and become as little children, you shall not enter into the kingdom of heaven” (Matthew 18:3). From the words of the Lord, I saw that only when we become an honest person who is innocent and open just like a little child can we enter into the heavenly kingdom. Therefore, I consciously checked myself against God’s words, “Am I an honest person now? Have I become a little child as the Lord requires?” Through self-reflection, I recalled one scene after another of my actions: Sometimes I achieved nothing in my duty, and I was afraid that my brothers and sisters would look down upon me because of that, so when the leader asked me about the situation regarding my work, I would consciously evade her question and report only the good and not the bad. Sometimes when the leader talked to me about some church matters, because I was afraid to bear responsibility if I misspoke, I would make an excuse by saying that I could not see through these problems and tell her to ask others. Sometimes when I saw that other brothers and sisters did something at odds with God’s will, I wanted to fellowship with them, but I was worried that they would not accept but would form opinions about me if I pointed out their problems, so I just turned a blind eye and pretended not to know. Thinking of these things, I found that I was so deceitful and not honest at all. How could I enter into the heavenly kingdom with such actions? Accordingly, I prayed to God and asked Him to lead me to betray my flesh and practice the truth, so as to be an honest person who can delight Him. This shows us that only by reading God’s words, checking ourselves against His words and reflecting on our corrupt dispositions when practicing spiritual devotions can we constantly enter into the truth and grow in life. If we adhere to these three principles, we will achieve the due results in our spiritual devotions and become even closer to God, our hearts will be occupied by God’s words and our spiritual condition will also become increasingly normal. Dear brothers and sisters, what are you waiting for? If you want to achieve results in your spiritual devotions, hasten to practice these principles. How do we read the word of God? Grasping these 3 keys for reading the word of God helps you know the word of God better and grow spiritually!